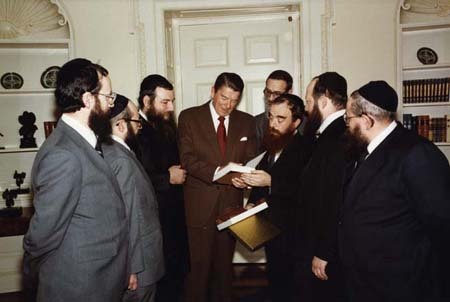 President Ronald Reagan was an "enthusiastic adherent" of Rabbi Menachem M. Schneerson, of Ukrainian-Jewish descent, and "the Rebbe's call to make all people aware of the Seven Universal Laws, based on the belief in a Supreme Being." Schneerson encouraged public school officials to implement "a moment of silence." He believed that "America must export to the world faith-based moral values." President Reagan was very open to those ideas. 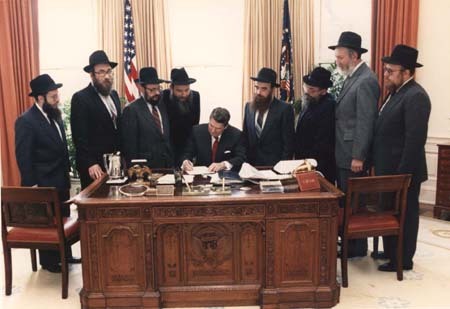 On April 15, 1981, the Chabad-Lubavitch community was celebrating the 79th birthday of the Rebbe, or righteous memory. The president participated in the celebrations by sending a telegram. 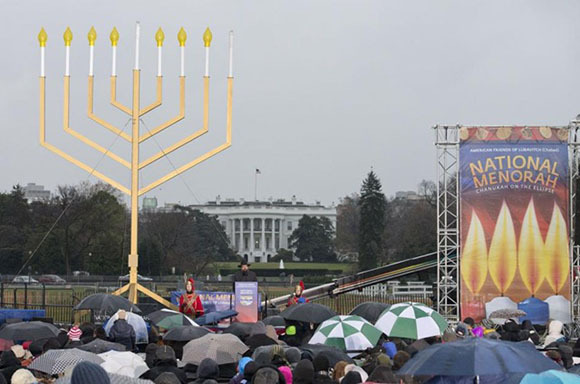 President Bill Clinton wrote in his proclamation of 1995: "Rabbi Menachem Mendel Schneerson, the Lubavitcher Rebbe, well understood the importance of nurturing the heart along with the mind. Throughout his long and rich life, he believed that the education of our young people would only be successful if it sought to build character as well as intellect, if it taught the lessons of honesty, tolerance, and good citizenship, as well as language, math, and science. This year, let us rededicate ourselves to teaching the love of learning that was championed by Rabbi Schneerson and is strengthened by caring leaders like him throughout our Nation. As we provide our students with the information and practical tools they need, let us also pass on to them the capacity for understanding that can help to give fuller meaning to their lives." 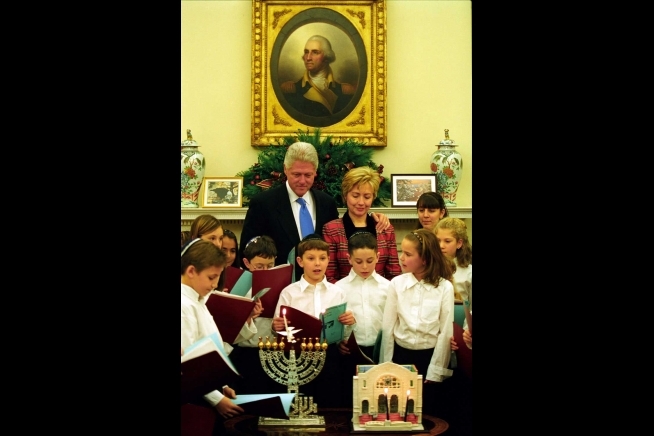 Bill Clinton and Hillary Rodham Clinton at a Hanukkah celebration in the Oval Office, December 21, 2000. 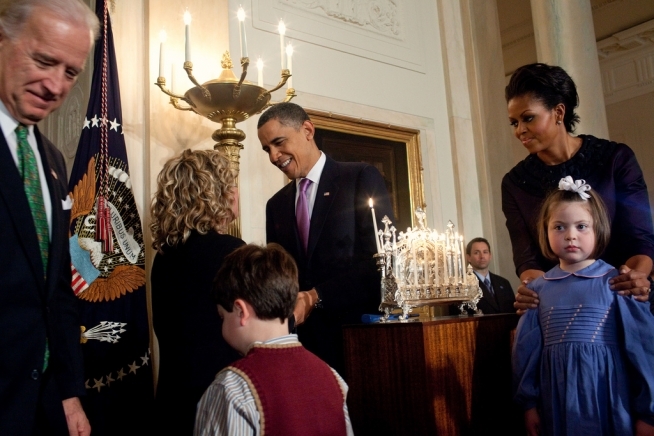 President George W. Bush wrote in his proclamation on Education and Sharing Day 2007: "Education and Sharing Day honors the legacy of Rabbi Menachem Mendel Schneerson and emphasizes our commitment to teach the next generation of Americans the values that make our country strong. 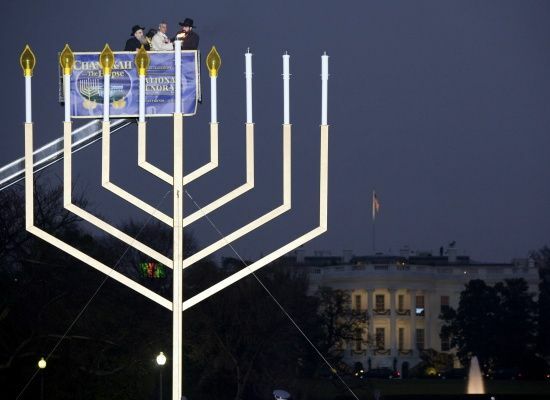 The Lubavitcher Rabbi believed that society should 'make a new commitment to kindness,' and he helped to establish education and outreach centers offering social service programs and humanitarian aid around the world." 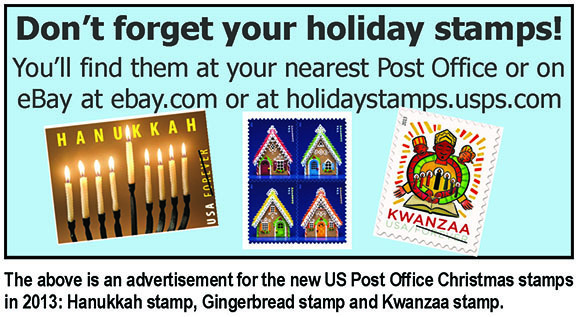 See Religious Holiday Displays on Public Property.